That’s what the Buddha reportedly said. That’s a scary notion. But the Chandogya Upanishad reminds us that we are never lost even when gazing at the abyss since there’s a light that shines within and without that transcends it all. Sorry, but the Upanishads beat the buddha to that line by centuries. As your deed is so is your destiny. Far more complete, far more profound. In fact, it was Adi Shankaracharya who demonstrated in his debates with monks that Buddhism was nothing but hinduism ‘lite’. Don’t tell that to our politicians though. So everything is there in our ancient culture. Everybody is copying …..everything is a copy. We can keep arguing about who came up with it first, or we can use the teaching. Your choice. Does it really matter if it was Buddha or Vasishta or the local crazy man who talks about this? How many people have really truly understood what the sages were saying? 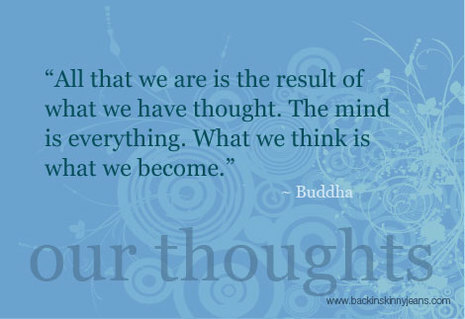 The Buddha used the word “mind” as a tool to go beyond our concept of mind. There are thoughts following thoughts following thoughts. You know they are real because you can measure the effect through and EEG. It is human nature to create chains between these thoughts and look at it as a continuous happening, the mind. You cannot see the mind, measure the mind, feel the mind, hear the mind, touch the mind or see the mind. You cannot even measure its effects on other objects. Hence there is no mind. Buddha said the same thing as Vasishta. Almost all of us are stuck with this illusion of being trapped by the mind, a slave to it. He showed us a path to go beyond this by meditating deeply upon the nature of the mind, and hence transcending it. You do not experience a brilliant flash of light or singing angels. The transformation is the most ordinary experience you will have. You simply start seeing things for what they are. You see thoughts for what they are. You don’t need to create a “mind”. YOU are the origin of these thoughts and actions. Realise that. Ask “Who am I”? 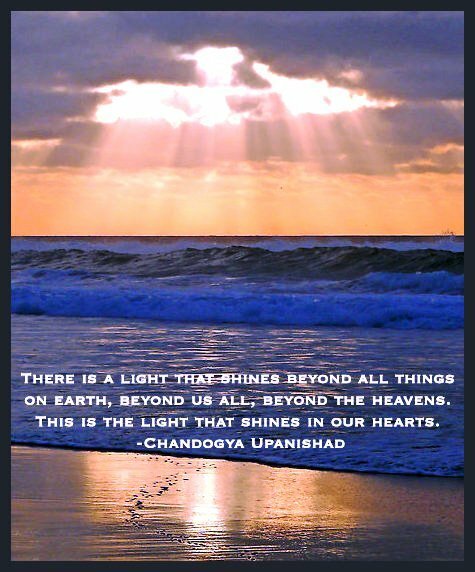 That is the light the Chandogya Upanishad talks about. That is the truth they describe. This is what Ramana Maharishi and Ramakrishna talk about when they say “self realisation”. It is something you have to realise for yourself, because no one can tell you what it is. No can give it to you. The teacher can only point to the direction, but we have to go deep and realise for ourselves. Then comes a subtle but unshakable knowledge based on direct experience. This is the truth they are all pointing to. Let go of mine, yours, Buddha, Hinduism, I am greater, you are copying me, and all this chatter. Just be. Live. Seek. Realise. “”So everything is there in our ancient culture. Its said by the best scholars on early Buddhism such as Coomaraswamy, Rhys Davids and countless others that its not all that different from Hinduism–the main difference in Buddhism being one is not a Brahmin by brith but by gnosis i.e. knowledge. The fact that the Mongolian countries have adopted Buddhism developed their own peculiar schools around Buddhism does not destroy this central facet of early Indian Buddhism which is evident to all who read the earliest Pali scriptures. It’s said by the best scholars on early Buddhism such as Coomaraswamy, Rhys Davids and countless others that it’s not all that different from Hinduism–the main difference in Buddhism being one is not a Brahmin by brith but by gnosis i.e. knowledge. The fact that the Mongolian countries have adopted Buddhism and developed their own peculiar schools around Buddhism does not destroy this central facet of early Indian Buddhism which is evident to all who read the earliest Pali scriptures. Yes, we Indians invented and discovered everything. So effing what? The fact remains that we have been invaded, divided and reduced to a state of poverty by whomsoever it may have concerned. This includes the Ghauris, the Portugese, the Brits, and our own fellow countrymen. What good is a civilization that cannot defend itself? What good is a civilization that cannot pull it’s own out of poverty and misery? More importantly what good is it to dwell in this glorious past, when what matters is here and now or the future? Every descendant of every civilization or religion has something to gloat about. Yes, Indian civilization should get a medal for inventing everything! Kshma shobhti us bhujang go jiske pass garal ho!